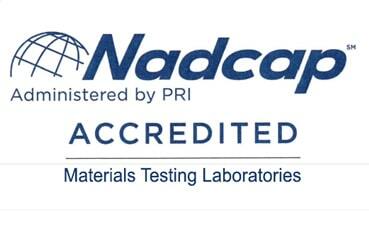 "With over five decades of materials testing experience, and key Nadcap and A2LA accreditations, WMT&R is uniquely qualified to test materials created using additive manufacturing processes. " 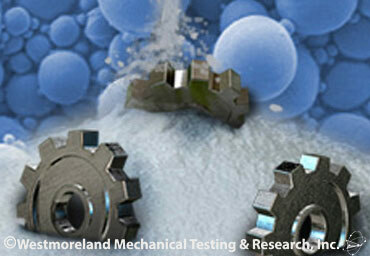 Expedited Additive Manufacturing Testing Services Are Available- Contact Us Today! Capacity from 10 Grams to 1,000,000 lbs. What Materials Can Be Used in Additive Manufacturing? How Is Additive Manufacturing Performed? 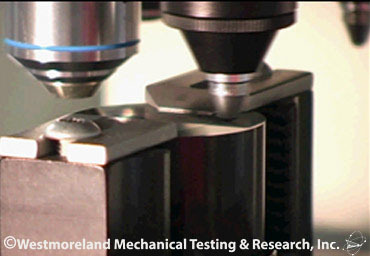 Westmoreland Mechanical Testing and Research, Inc (WMT&R) is a trusted testing partner for the aerospace primes and other companies in advanced industries such as automotive, medical, and power generation who are leading the adoption of additive manufacturing materials and processes. In addition, WMT&R has been working closely with the leaders of additive manufacturing to learn more about the characteristics of these materials and advance the additive manufacturing processes. Direct Metal Laser Melting, Direct Metal Laser Sintering, Selective Laser Melting, and Selective Laser Sintering are all very nearly the same process, with the main difference being applicable materials and the temperatures required to fuse the material together. Selective Laser Sintering and Selective Laser Melting can refer to any material. 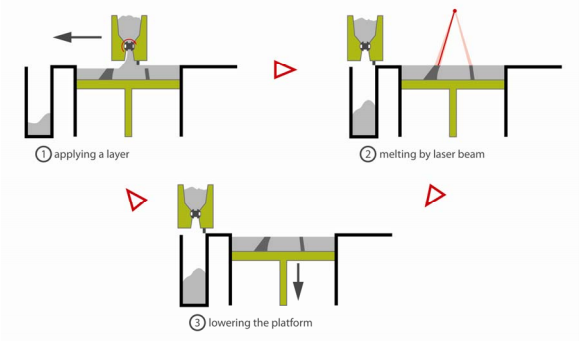 Direct Metal Laser Sintering and Direct Metal Laser Melting refer only to metals They are commonly done using a Yb-YAG laser and require an inert gas environment such as Argon. Electron Beam Melting uses an electron beam instead of a laser to melt the metal that is being built. EBM can be used on both powdered metals and metal wire. In the case of metal wire, the feed wire is melted and welded in successive layers on a substrate. 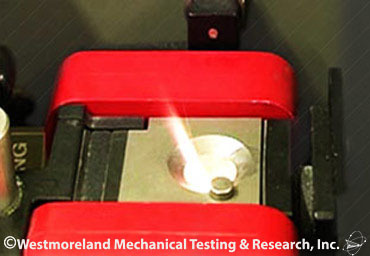 With over five decades of materials testing experience and key Nadcap and A2LA accreditations, Westmoreland Mechanical Testing & Research, Inc (WMT&R) is uniquely qualified to test materials created using additive manufacturing processes. WMT&R's services are providing hundreds of companies with a unique competitive advantage. We are materials testing specialists in additive manufacturing on many different types of specimens, including extensive specimen traceability services. WMT&R can provide materials testing on additive manufacturing materials such as solids, metals, powders, and as-built specimens. WMT&R designs and writes proprietary software to analyze test results. To ensure the best turnaround time on your projects, WMT&R designs and machines specialized fixtures on-site. Expedited services are available, ask us how. 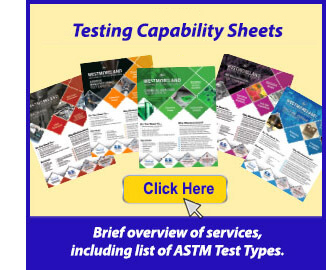 For your unique testing needs WMT&R has the resources, experience, and testing capacity to answer all of your materials questions for any application, customizable to your requirements. WMT&R has the flexibility and resources to accommodate a broad range of sample sizes with our machine capacity ranging from 10 grams to 1,000,000 lbs. WMT&R has a variety of customizable test setups and equipment for testing specimens in a number of environments and temperatures, from Cryogenic to 3000°F, high humidity to fluid immersion, we can help you mimic any real world application or requirement. The testing laboratories at WMT&R are supported by an on-site machine shop, available 24 hours a day, seven days a week to manufacture test specimens to meet any customer schedule. Below is a sample list of the Additive Manufacturing Standardized tests that Westmoreland Mechanical Testing & Research, Inc (WMT&R) can perform, including the ability to test to individual customer specifications. Additive manufacturing is the cutting edge of materials science. In additive manufacturing (sometimes referred to as 3D printing), 3D objects are constructed layer by layer with specialized equipment, thus minimizing material waste and finish machining. The additive manufacturing equipment receives data from a CAD file and creates an object by adding successive layers of liquid, powder, or sheet material. A wide variety of metals, plastics and composites can be used in the process. The additive manufacturing equipment receives data from a CAD file and creates an object by adding successive layers of liquid, powder, or sheet material. A wide variety of metals, plastics and composites can be used in the process. Most additive manufacturing procedures are fairly similar in process although the method of applying successive layers varies from method to method. Most types of additive manufacturing start with a metal base plate called a substrate onto which the desired part is built. For powder based technologies, a metal powder is spread over the surface and one of several fusing methods is applied in only the desired locations for that cross section. The locations for the beam to fuse are determined by a CNC program. The substrate is then lowered one step and more powder is spread over the surface. This iterative process, as shown in the figure below, is repeated as necessary. The capabilities of additive manufacturing enhance product customization and enable efficient, cost-effective production and delivery. The method to fuse successive layers varies from process to process, although the two most common methods are sintering and melting. Melting requires higher temperatures because of the need to reach the melting point of the material that is being built, while sintering can be done at a lower temperature. Sintering fuses the material without having to liquefy the powder. Additive manufacturing processes can create objects by adding successive layers of liquid, powder, or sheet material. Additive manufacturing can be performed with metals, plastics, and composites to create printed objects. 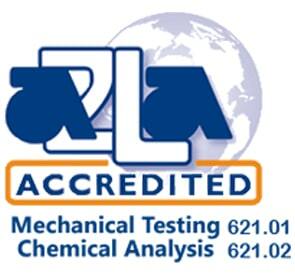 For a Complete List of Additive Manufacturing Testing services, Please Request A Quote or Call 724-537-3131.